To love on: The action of being lovey-dovey with another person, including physical petting, hugging, kissing and making generally mushy-sounding small talk, including baby words. Related to lovin’, which is an action verb that applies to favorable consideration of activities, attitudes, people, places and things. Folks around here love chicken on a stick. In fact, we’re sort of famous for the popular local protein-on-the-run. It’s a fact, though — Oxonians didn’t invent chicken on a stick. It’s not even the first food ever threaded on a stick. Humans have been applying the food-plus-stick-plus-fire concept to anything that runs, flies or swims since the first upright primate figured out that grilled food is tastier than raw. In communities on every habitable continent (Antarctica is excluded to date), people have their favorite forms of stick-grilled food, often produced over open flames on busy streets. 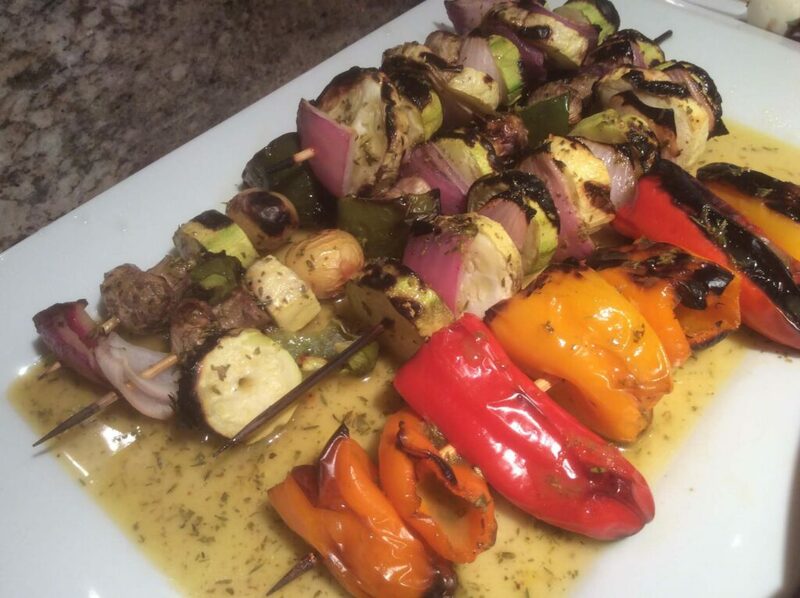 Think about popular variations such as kebabs and brochettes. However, I claim that our Southern ancestors perfected the art of stick grilling when scavenging for food during lean times. They discovered that stick-grilled foods provided the perfect vehicle for flora-based rubs and marinades concocted for the purpose of hiding inherent flavor flaws. Think roasted raccoon or opossum and sweet potatoes. Or – as our Vicksburg ancestors discovered during the terrible siege – roasted rat. The concept stuck, so to speak. And like all shortcut-loving Americans, we modern Southerners love converting otherwise “normal” fork cuisine into fast food. Summertime is here to stay, and the weather’s too soupy to turn on the stove. It’s time to get creative. Salads, desserts, side dishes and meat courses all adapt beautifully to the stick. 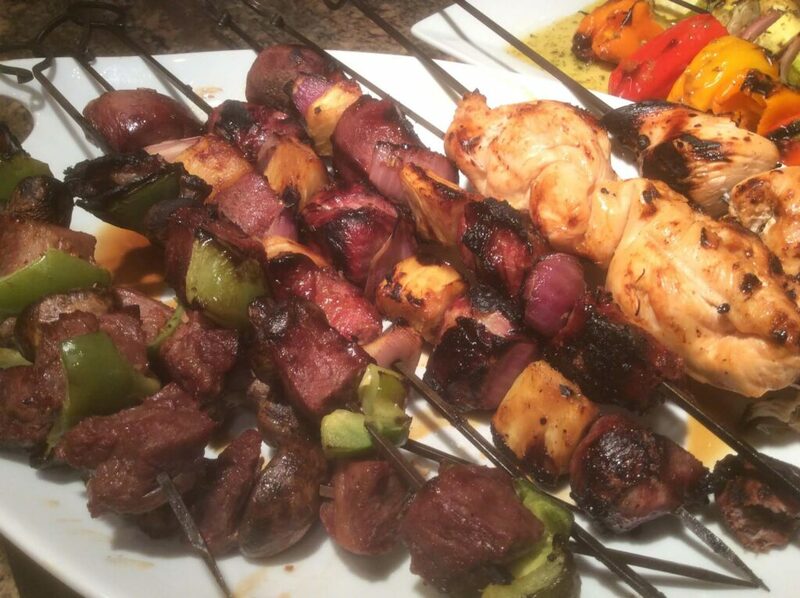 But note: Use metal skewers instead of the inexpensive bamboo ones if the food requires grilling. 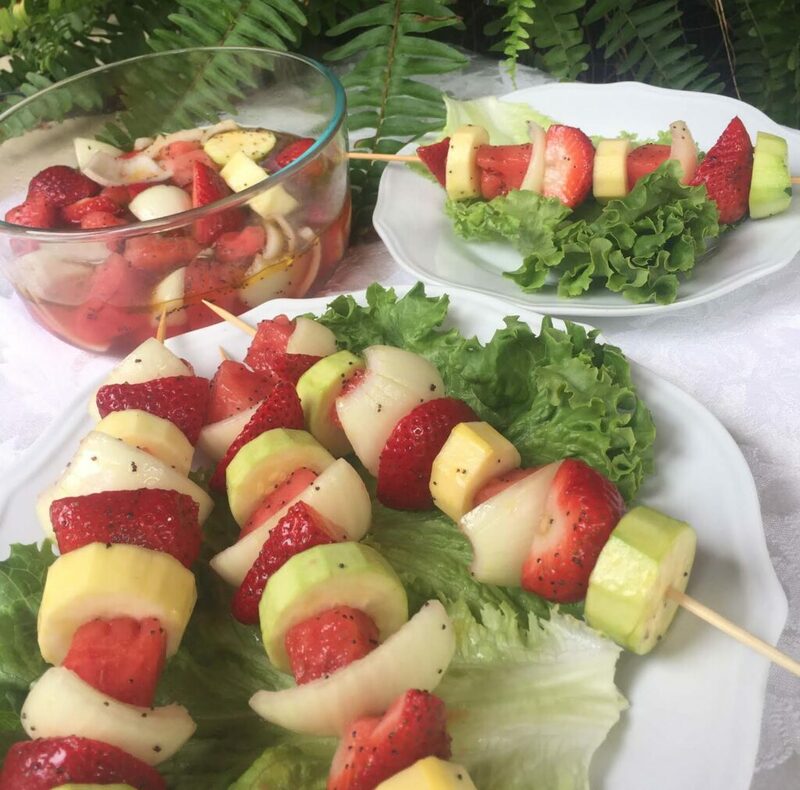 Save the wooden skewers for the cold foods. Fine-chop fresh basil and spread out on a cutting board to dry for about an hour. Scrape into a large bowl and combine with the garlic powder and sea salt until they become a blended rub. Whisk together the balsamic and olive oil. Skewer tomatoes, basil leaves and mozzarella balls onto wooden picks, alternating until about three of each line the pick. 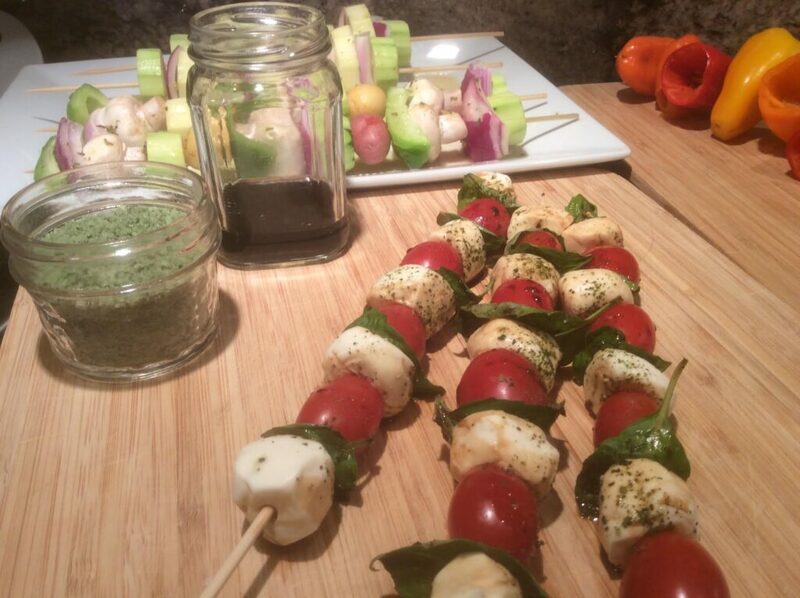 Over a wax-paper lined pan, drizzle skewered salad with the balsamic oil and roll to coat all sides. Sprinkle with basil-garlic-sea salt rub and serve. Whisk the first 6 ingredients until blended. Combine Veggies and fruit in a large bowl and add the dressing. Toss to blend. Refrigerate, covered, until 30 minutes before serving. To serve, thread on wooden skewers. Serve on a bed of green leaf lettuce, sprinkled with crumbled feta. For a Latin flavor, substitute lime juice for the lemon, large jalapeño peppers for bell, and minced cilantro for thyme. Whisk lemon juice, chopped thyme, mustard, honey and seasonings together in a small bowl until emulsified. Add olive oil in a steady stream, whisking to blend until smooth. Thread bell peppers, zucchini rounds, onion wedges and mushrooms on skewers, alternating, with the pepper wedges serving to hold the more fragile veggies intact. Grill on hot grill, turning 4 times during 15-20 minutes, until all sides have been charred. Remove from grill, rake off into large butter lettuce leaves and drizzle with more lemon-thyme dressing. Top with salt and pepper to taste. Combine all ingredients except the chicken. Whisk to blend. Submerge the chicken in the marinade and refrigerate, covered, at least 2 hours. Thread the chicken on metal skewers; grill 4 minutes on medium-high heat; turning two to three times after 3 minutes, until center of chicken is 160˚F (opaque when cut). Serve while hot. Refrigerate leftovers and toss with leftover watermelon-strawberry-cucumber salad. Combine dry rub of choice with vinegar and whisk in oil, Worcester, lemon juice, mustard, garlic and sugar until blended. Pour marinade over beef in a large sealable bag. Seal and shake to coat evenly. Refrigerate at least 4 hours, turning the bag at least once. Thread beef onto skewers, alternating with bellas and onion. Discard marinade. Grill on medium-hot grill, turning a quarter turn about every 3 minutes to sear all sides. Ready to eat when center of beef registers 125-130˚F. Combine first 6 ingredients and bring to a boil. Cool and add the pork chunks. Marinate in fridge, covered, for 4 hours. Thread pork onto skewers, alternating with pineapple and bell pepper chunks. Grill 4 minutes per side on a hot grill, lid closed, turning at least three times, until center of meat reaches 145˚F.